Though many combinations of frame spacing and plywood class and Performance Categories will meet the structural requirements, it is probably better to use only one class and Performance Category of plywood and then vary the frame spacing for different pressures. Plyform can be manufactured in various Performance Categories, but 19/32, 5/8, 11/16, 23/32 and 3/4 Plyform Class I panels are most commonly available. 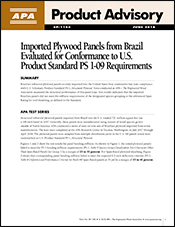 The plywood Performance Category should be compatible with form tie dimensions. For large jobs or those having special requirements, other Performance Categories may be preferable, but could require a special order. Photos courtesy of Swanson Group Mfg. LLC. The required plywood class and Performance Category, as well as size and spacing of framing, will depend on the maximum load. 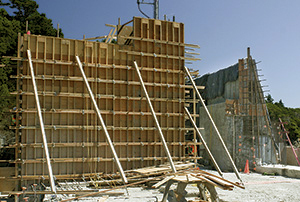 The first step in form design is to determine maximum concrete pressure. It will depend on such things as pour rate, concrete temperature, concrete slump, cement type, concrete density, method of vibration, and height of form. The lateral pressure for newly placed concrete is based on the recommendations of the American Concrete Institute (ACI). When formwork is to be designed for exterior vibration or to be used in conjunction with pumped concrete placement systems, the design pressures listed should increase in accordance with accepted concrete industry standards. Concrete form design procedures are based on ACI standard 347R-14, which recognizes the use of a large number of variables in modern concrete designs. These variables include the use of various cement types, admixtures, design slumps, concrete placement systems, etc. The effect of some of these variables on concrete forming pressures is addressed by the unit weight coefficient, Cw, and the chemistry coefficient, Cc, as shown in the Tables 10 and 11, respectively in APA Design/Construction Guide: Concrete Forming, Form V345. Forms for concrete slabs must support workers and equipment (live loads) as well as the weight of freshly placed concrete (dead load). 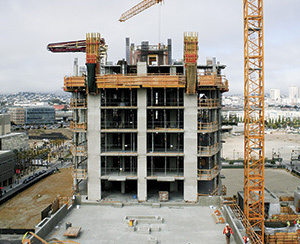 Normal weight concrete (150 pcf) will place a load on the forms of 12.5 psf for each inch of slab thickness. Plyform can also be used for curved forms. Minimum bending radii information can be found in APA Design/Construction Guide: Concrete Forming. Recommended maximum pressures on Plyform Class I are found in Tables 3 and 4 in APA Design/Construction Guide: Concrete Forming, Form V345. Tables 5 and 6 show pressures for Structural I Plyform. Calculations for these pressures were based on deflection limitations of 1/360th or 1/270th of the span, or shear or bending strength: whichever provided the most conservative (lowest load) value. Use unshaded columns for design of architectural concrete forms where appearance is important. Textured plywood has been used to obtain various patterns for architectural concrete. Many of these panels have some of the face ply removed due to texturing. Consequently, strength and stiffness will be reduced. As textured plywood is available in a variety of patterns and wood species, it is impossible to give exact factors for strength and stiffness reductions. In some cases, it may be desirable to use two layers of plywood. 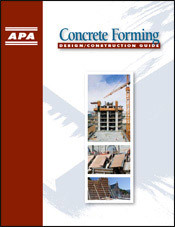 Concrete forming design examples can be found in APA Design/Construction Guide: Concrete Forming.